5 Things We Learned About This Week's ESO Murkmire DLC Announcement! The Elder Scrolls Online’s next content update, Murkmire DLC is almost here. Having just been given a free pet, mount and mansion for taking part in the Summerfall event, there’s a good buzz surrounding the game and the players. Zenimax Online Studios wants to keep that continuing, and today we got more good news about the latest DLC! The official release dates for the Murkmire DLC are here! Murkmire will be playable on PC this October 22nd. Console players will have to wait only slightly longer. PS4 and Xbone players can get involved on November 6th. As a reminder, the update will be free for ESO Plus members, and folks can purchase it for Crowns in the in-game store. Additionally, you can already start doing the prologue quest! Simply log in right now and head to the Featured section of the Crown Store. There, you’ll see a call for aid by the Cyrodilic Collections. Simply hit E to receive the item in your bags, to start the quest. The prologue quests offers a narrative prelude for players heading into the Black Marsh later this month. It also introduces a few new characters like Concordia Mercius – an Argonian relic hunter – who’s collecting valuable Argonian antiques in her goal to restore Murkmire’s history. But perhaps the best news we learned today involves all players, whether or not you’re ESO Plus doesn’t matter. All players will be able to get the latest Murkmire DLC for free in November! How? Simply log in and claim your Daily Reward for 24 days (or 24 days in total) to get the DLC as a reward. That’s right, you can get ESO’s latest DLC for free next month, by simply logging in daily and clicking a button. This is a new for ZOS one must admit, and as players we’re getting pampered quite a bit. Remember that prologue quest we talked about earlier? It’s not just to whet your appetite for the upcoming story. Completing the prologue quests will also reward you with a brand new Momento to pull out and have fun with. 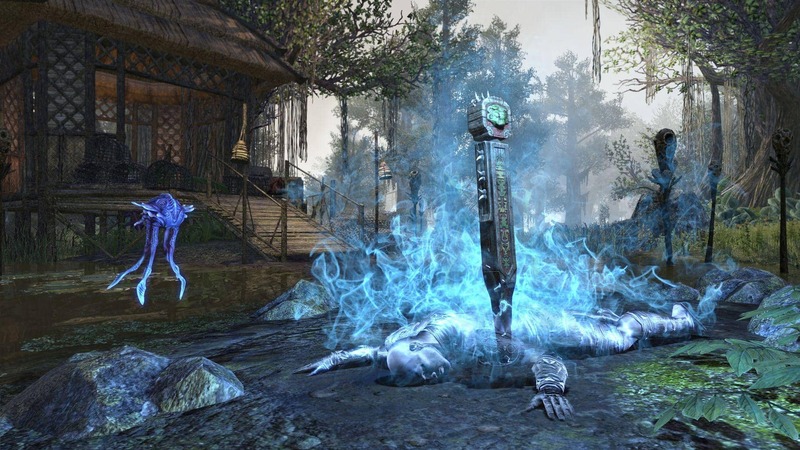 Murkmire Grave-Stake memento is an important relic for those Argonians who live and thrive in the deep swamp. Finally, when you complete one of the six new daily quests, you’ll receive a reward box that can contain a selection of useful Murkmire-themed items, including a chance to pick up one of seven fragments required to create the adorably squishy Swamp Jelly pet!